SOCHI, Russia (AP) In the euphoria of the moment and the kind of exhilaration he had never experienced before, Roman Torres completely lost sense of time. He ran, and screamed, and ripped off his shirt amid the noise echoing through Estadio Rommel Fernandez creating a haze of joy and excitement. When the celebration finally dispersed and reality hit there was still work to do, Torres placed his hands over his mouth and made a request of the referee issuing him a yellow card for being too exuberant. ”I asked him how much time was left and that he end the match quickly,” Torres recalled. 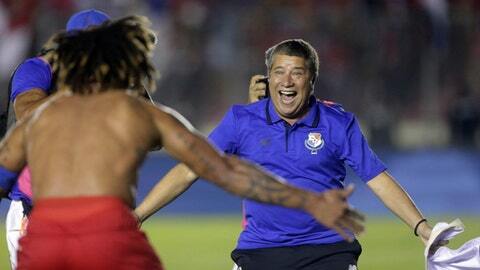 It’s been eight months since that night in Panama City when Torres became a national hero. Tied 1-1 in the 88th minute against Costa Rica and in need of a goal to keep its World Cup hopes alive with the United States flopping at Trinidad and Tobago, Torres unleashed a right-foot bolt from 11 yards in front of goal, beating goalkeeper Patrick Pemberton. In an instant, Torres sent Panama to the World Cup for the first time with his winning goal – knocking out the U.S. – and cast himself as an unforgettable figure in his country’s history. One moment. One shot. A long-awaited World Cup appearance that begins Monday night on the edge of the Black Sea with Panama facing Belgium. It’s one thing to be a star in a soccer-crazed country. It’s another to be responsible for a moment of unbridled joy and euphoria. Here’s the thing about Torres: he was already widely recognizable. Whether it’s his stature at 6-foot-2, his wide grin or his big hair, it was easy to pick out Torres in a crowd. And then it became amplified in a way even Torres could not have expected. He went from being the captain of the Los Canaleros, to national hero. On the cusp of another devastating shortcoming on the soccer field, Torres and his right boot became etched in Panamanian history. Now something mundane like going to the store can turn into a crush of fans wanting their moment with Torres. Trips to his old neighborhood are mob scenes. He didn’t ask for this type of attention and notoriety. He accepts it as part of who he has become. Just a few years ago, Torres being in that position was in question. Shortly after his arrival in the United States to join the Seattle Sounders in MLS, Torres sustained a torn ACL in his left knee and was sidelined for nearly a year. When Torres returned, he played with the same aggressive, attacking style of defense that first attracted the attention of MLS and made him a stalwart for Panama. Yet he’ll be forever remembered in Seattle for his right foot, just like he is in Panama. Torres scored the deciding penalty to win the 2017 MLS Cup for Seattle, giving the club its first league championship. That goal was a precursor for what he did for Panama. And Torres understands the task beginning Monday night – while a moment of immense pride and emotion for himself and his teammates – will be tougher than anything they’ve faced.